A modern update to the classic chandelier, this six-light pendant boasts a minimalist-inspired open silhouette. 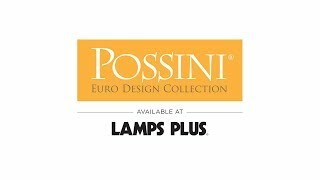 This six-light bowl pendant by Possini Euro Design® offers an updated take on classic chandelier form. Crafted from metal, it features a lustrous brushed nickel finish with light glowing from within the large clear glass bowl-shaped shade. Complete an entryway or dining room with the beautiful silhouette and chain, adaptable for sloped ceilings. 26" high x 19 1/2" wide. Canopy is 5 1/4" wide. Glass bowl is 17 3/4" wide x 5" high. Weighs 10.1 lbs. Comes with 6-feet of chain and 12-feet of clear wire. Sloped ceiling adaptable. Uses six maximum 40 watt type B bulbs (not included). Milbury six-light bowl pendant by Possini Euro Design®. Brushed nickel finish over metal construction. Clear glass. Perfect for use over a kitchen island or dining room tablethis lantern-style six-light pendant features a polished nickel finish and clear glass. Turn up the volume on dynamic design in a living space with this stunning small six-light pendant. Upgrade to high-style and energy-efficiency in your decor with this stunningmulti-light brushed nickel pendant featuring integrated LEDs. Pleated white shades add a soft touch to this modern three-light pendant.